Matt and Shannon met thanks to match.com, and just in the nick of time, as Shannon had debated giving up online dating. Matt sent her a message that quickly led to a first date on St. Patrick's Day. Matt won her over on her birthday, later in April, with flowers and a gift along with a donation to one of her favorite charities. A year and a half later, Matt wanted to surprise her with a proposal. Matt, a choir director, invited Shannon to his group's Christmas production, where she was called up at the end of the show and given a mug with an inside joke. While opening the gift, Matt snuck on stage behind his cast and they parted to reveal him. While a student sang "I Can't Help Falling in Love With You," Matt launched into his commitment to her and his desire to be with her always. Shannon said yes before he'd even finished asking. 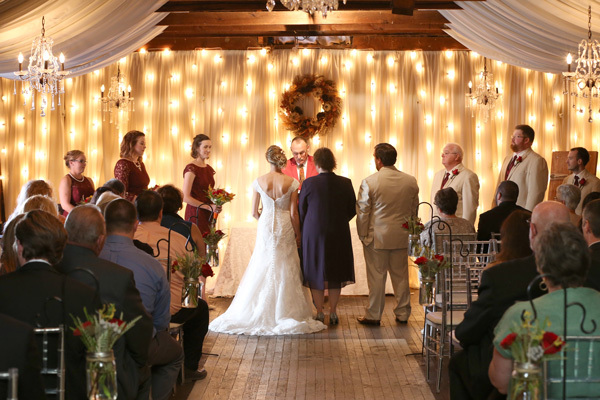 The couple's favorite wedding day memory took place during the ceremony when they tied their unity braid, which was attached to a large cross. It was a special item for them because it was handmade by a good friend, and a great symbol of their intentions to keep God in their relationship. Because Matt is a vocal director, he hand-selected a few students to perform as a small choir during the moment. 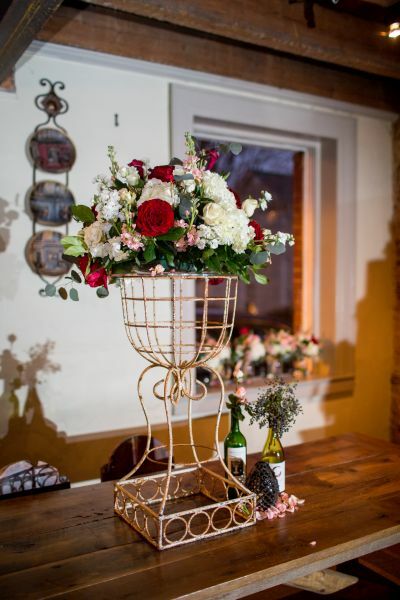 The newlyweds wanted a fall theme, with rich colors in the decor and flowers. 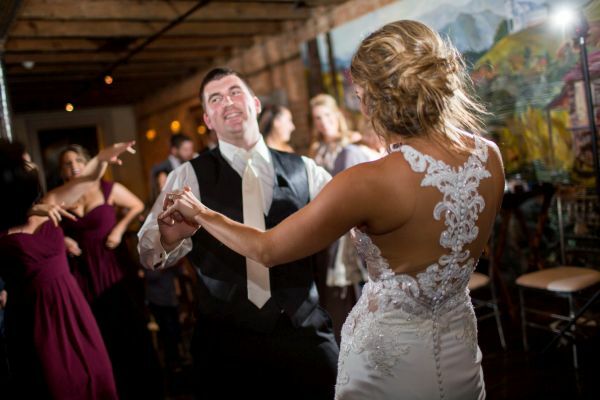 Shannon's mother walked her down the aisle, while Shannon's sister was her Matron of Honor. 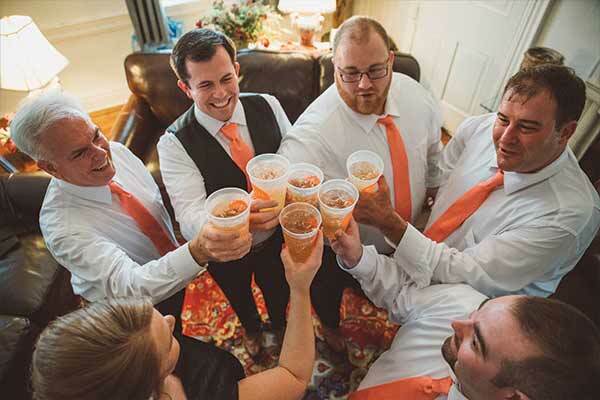 Matt's father was his best man, while their pastor has been Matt's mentor for over twenty years. 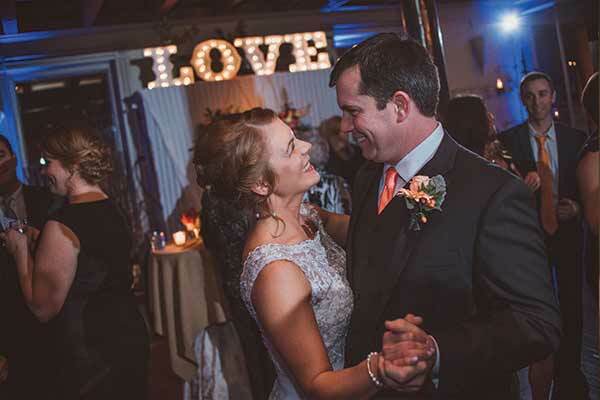 Because their first date was on St. Patrick's Day, guests received scratch lottery tickets as favors, with a personalized "lucky in love" stamp and thanks on each envelope. Because Matt is a big fan of socks, he picked out a pair for each of his groomsmen, and wore his own Virginia Tech socks to support the team on football game day. He also bought personalized ammunition cans for the boys, stored with snacks and other goodies to get through the day. Matt also made the centerpieces, with artificial pumpkins and flowers that would later be used in their own home during the fall season. 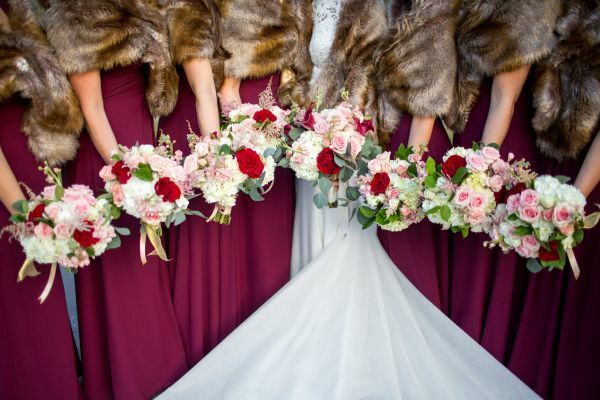 Make sure to see more of the Bartley wedding on page 92 of bridebook! Jennifer and Jared met when one of Jennifer’s colleagues set them up on a blind date. Jennifer almost didn’t go, but she says now it was one of the best decisions she’s ever made. Jared’s proposal lasted twelve hours. It started at seven in the morning with a scavenger hunt. 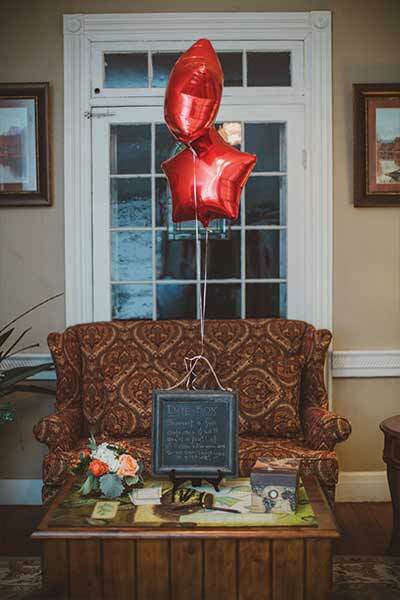 Red balloons scattered throughout the city marked important moments in their relationship, and each spot had an envelope with scrapbook pages telling their love story from Jared’s perspective. At the end of the day, he was waiting at the last stop with the most beautiful ring Jennifer had ever seen. Jennifer’s favorite memory of the wedding day was when she first saw Jared. 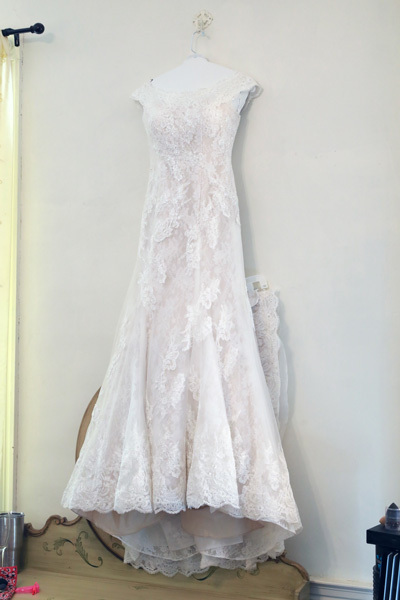 They had decided against doing a first look, wanting to have that special moment when they saw each other and realized this was really happening. Jennifer wasn’t disappointed—when she got to the start of the aisle, Jared already had tears in his eyes. Some of the most important aspects of the wedding to Jennifer were the flowers and the cake, because her groom’s family designed them. Jared’s father designed the wreath and sideboard at the ceremony, helping enhance the fairytale theme they were going for. Jared’s sister designed the cake, with only a few specifics from the bride and groom to get her going. For Jennifer and Jared, all this made the day even more special because it was all a surprise for them too. Their venue was the perfect place for their fairytale theme. 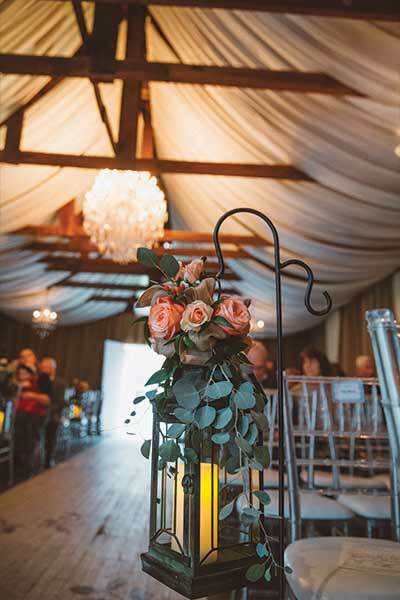 The barn on its own felt magical, but coupled with the flowers and all the personal touches it looked even better than they’d hoped. Sconces framed the doors, and the flowers from Jared’s father were perfect. The music kept everyone happy all night, and the DJ even joined them on the dance floor at one point. Their photographer captured every moment, and the pictures they have now are beautiful reminders of the day. 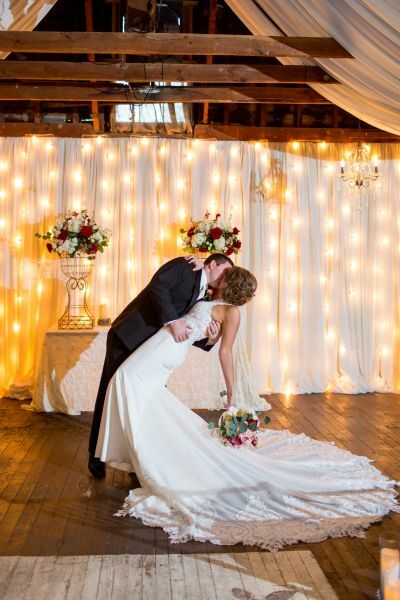 Make sure to see more of the Frye Wedding on page 110 of bridebook!